Titanium is also incredibly durable and long-lasting. When titanium cages, rods, plates and pins are inserted into the body, they can last for upwards of 20 years. And dental titanium, such as titanium posts and implants, can last even longer. Osseointegration is a unique phenomenon where your body’s natural bone and tissue actually bond to the artificial implant. This firmly anchors the titanium dental or medical implant into place. Titanium is one of the only metals that allows for this integration. Most all of us know someone who has required orthopedic surgery to replace a failing hip socket, shoulder joint or severely broken bone. It’s very likely medical grade titanium was the material of choice for the surgeons when reconstructing these parts of the body. 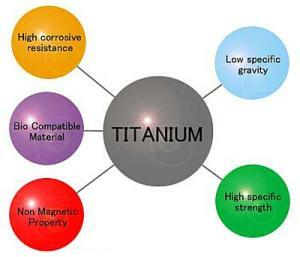 As evidenced in the previous section, natural titanium properties make it a perfect alloy to be used within the body. 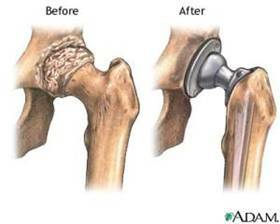 Some of the most common uses for titanium are in hip and knee replacement surgeries. It is also used to replace shoulder and elbow joints and to protect the vertebrae following complicated and invasive back surgery. Titanium pegs are used to attach false eyes and ears and titanium heart valves are even competing with regular tissue valves. It’s harder than some steel, yet lighter in weight. Again, it can be used in conjunction with instruments emitting radiation. Titanium is incredibly durable, giving instruments greater longevity. As mentioned earlier, titanium has the ability to fuse together with living bone. This property makes it a huge benefit in the world of dentistry. Titanium dental implants have become the most widely accepted and successfully used type of implant due to its propensity to osseointegrate. When bone forming cells attach themselves to the titanium implant, a structural and functional bridge forms between the body’s bone and the newly implanted, foreign object. Titanium orthodontic braces are also growing in popularity. They are stronger, more secure and lighter than their steel counterparts. And of course, medical grade titanium’s biocompatibility makes its use in braces even more beneficial than its competing alloys. It is expected that use within the biomedical industry will only continue to grow for titanium in the coming years. With the baby-boomer demographic continuing to age and our health industry pushing for people to live more active lives, it’s only logical that the medical industry will continue researching new and innovative uses for this popular metal alloy. And with health care reform a current major issue, titanium’s cost-efficiency adds even more appeal to those looking to cut health care costs. Craig Schank is General Manager of Supra Alloys, a full-service titanium supplier and processing center headquartered in Camarillo, California. Craig has long experience in the special metals industry, with a particular interest in medical titanium applications. For more information, contact us via the website at www.Supraalloys.com, call 805.388.2138, or email the author at Craig@supraalloys.com.